Periodically I get a craving for chocolate. And when I do, I usually make Brownies. I like their strong chocolate flavor and their moist texture and I also like how quick and easy they are to make. 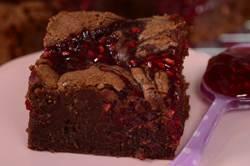 A recent addition to my recipe file is these Raspberry Brownies. There's no doubt that chocolate and raspberries are a perfect combination, and I think it's because the sweet tanginess of the raspberries nicely offsets the flavor of the dark chocolate. And if you have made the Raspberry Jam recipe on the site, this is one recipe that you'll want to make. To make Raspberry Brownies you need only one bowl, a wire whisk and a spatula (or wooden spoon). The deep chocolate flavor of these brownies comes from semisweet chocolate and a little unsweetened cocoa powder (either natural unsweetened or Dutch-processed). As always, the quality of the dark chocolate will affect the taste of your brownies. For this recipe I typically use a chocolate with a 54% to 60% cacao content. When choosing a chocolate, always buy one that you enjoy eating out-of-hand. The raspberry flavor comes from raspberry jam, and you can use homemade (recipe here) or store bought. We are not adding the jam directly to the brownie batter. Instead once the batter is in the pan, we swirl dollops of the jam through the brownie batter (similar to the cream cheese brownies). Now, the challenge with Brownies is how long they should be baked. It is amazing how just a minute or two will turn a moist brownie into one that is dry. So use the stated baking time as a guide only and test the brownies a few minutes before the end of the baking time. Test with a toothpick inserted into the center of the brownies. These brownies are done when the toothpick still has a little batter clinging to it and a few moist clumps. You do not want the toothpick to be clean as this means the brownies have been over baked. At room temperature these brownies are soft and cake-like, but when refrigerated their texture becomes dense and fudgy. Either way, they are delicious. Raspberry Brownies: Preheat oven to 350 degrees F (180 degrees C) and place the rack in the center of the oven. Butter (or spray with a nonstick cooking spray) an 8 inch (20 cm) square baking pan, and line the bottom of the pan with parchment paper. Melt the chocolate and butter in a large heatproof bowl placed over a saucepan of simmering water. Remove from heat and whisk in the cocoa powder and sugar. Next, whisk in the vanilla extract and eggs, one at a time, beating well after each addition. Finally, stir in the flour and salt. Pour into the prepared pan, smoothing the top with the back of a spoon or an offset spatula. Place the raspberry jam in a piping bag and pipe 16 small dollops (4 rows with 4 dollops of jam in each row) (can also just place small spoonfuls of the jam) evenly on top of the brownie batter. Run a knife or wooden skewer back and forth through the two batters until you have a marble effect. Bake for about 30 - 35 minutes, or until a toothpick inserted in the center comes out with a little batter and a few moist clumps clinging to it. Remove from oven and let cool on a wire rack for a few hours. Serve at room temperature or chilled. The brownies can be frozen.